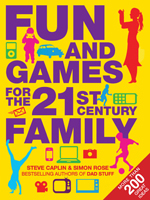 I like to think that I straddle the peripheral between traditional and modern when arranging "entertainment" so when I received an email from Simon Rose asking me if I'd like to review his new book - Fun and Games for the 21st Century Family - I thought this would be a really interesting read. I wasn't disappointed. Simon and his partner in crime, Steve Caplin, have managed to rethink family fun using pen and paper alongside modern day technology, such as mobile phones and Google Earth! The book is clearly laid out showing how many players are needed for each game or activity, any additional equipment and what age it is suitable for with easy-to-understand instructions. The book (and main index) are in alphabetical order and an additional index at the back groups games into categories - such as 'brain games', 'active games' or 'car games'. There are over 200 games and activities all together. The "techno section" is dedicated to helping you understand your computer more; creating and managing programmes that will help you play the games. The simple "random number generator" - or electronic dice - programme is one that even I can manage to build! The book works alongside a complimentary website - www.fg-21.com - where you can download all sorts of extras, such as grids and bingo boards to play some of the games. There is also a forum where you can chat to others about the activities and show-off your animations or videos. Pg 38 - Camera Scavenger Hunt - Photograph your "treasure" rather than collect it. I've also spotted some of the traditional pen-and-paper games like Dots and Beetle which will be great for our Boxing Day party and full rules for "games from the archives" like conkers and French cricket! This book is going to be a favourite on our family reading shelf for a long time to come! Do You Want To Moonwalk With Me?